Season XVI of the World Poker Tour is in the homestretch and on its way to sunny Hollywood, FL for a $3 million guaranteed event. 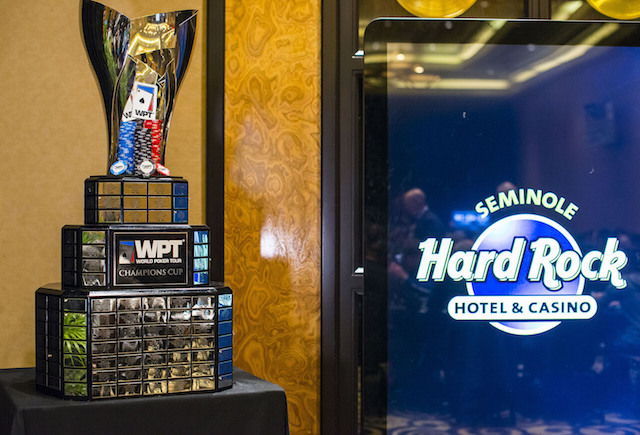 Seminole Hard Rock is the home to the largest field in World Poker Tour history and the Seminole Hard Rock Poker Showdown is expected to draw at least 1,000 entrants. From April 13-18, all eyes in North America are on one of the annual marquee WPT events. The Season XV version of Showdown brought in 1,207 entrants in only a single starting flight for a $2 million guaranteed prize pool. Tony Sinishtaj drove into the winner’s circle with $661,283 of the $3.862 million prize pool after defeating a final table of Dan Colman, Robert Mizrachi, and Darryll Fish. The current WPT season has been busy from the moment it started in August and the pace is still in fifth-gear coming into the final East Coast event of the campaign. Seminole hosted the World Poker Tour in January for the Lucky Hearts Poker Open and drew a field of 911 runners for a $2 million guarantee. The prize pool for that event brushed against the barriers of the $3 million and a four-figure amount of players at Showdown creates one of the highest pots of Season XVI. In Season XII, Seminole placed a whopping $5 million up for grabs and attracted 1,795 entrants for what still stands as the largest WPT field of all-time. Eric Afriat walked away with first-place and $1.08 million against a final table that included WPT Player of the Year Mukul Pahuja, future Champions Club Member James Mackey, and bracelet winner Chance Kornuth. Expect to see Afriat back at the Hard Rock in a few weeks for more reasons than just another title. Art Papazyan’s Season XVI Player of the Year lead decreases with every stop. Papazyan opened up a giant gap between him and the field after winning his second title of the season at WPT Maryland in October. The 2,400 points Papazyan holds are from his two titles, which are his only cashes of the season. Papazyan’s selective schedule means he may not show up to Florida and attempt to increase his overall total. Afriat is one of a few players who can overtake Papazyan with at least a final table finish. January’s Borgata Winter Poker Open featured a win from Afriat for his second career WPT victory along with 1,200 Player of the Year points. Coupled with his fifth-place result at WPT Montreal, Afriat stands with 1,700 points. In second place on the leaderboard is Derek Wolters, who has recorded two final table finishes along with three cashes in total. Wolters recently took third at the L.A. Poker Classic. That bronze medal sits next to the one he earned at WPT Montreal. Overall, Wolters is playing with 1,850 points heading down the stretch. The final member of the chase committee behind Papazyan is 2015 WSOP Main Event winner Joe McKeehen. Through a fourth-place result at Borgata and third-place at WPT Rolling Thunder in March along with two other cashes, McKeehen keeps pace with 1,600 points. A few others lurking who need at least 1,200 points to hit Papazyan’s mark are D.J. Alexander, Phil Hellmuth, and Lucky Hearts victory Darryll Fish. Seminole Hard Rock Poker Showdown features two starting flights and unlimited re-entry across both Day 1s. The total prize pool makes itself known after Level 9 on Day 1B. Levels on Day 1 and 2 are 60 minutes before ticking up to 90 minutes for Day 3 and Day 4. Final table levels are 60 minutes on Day 5 for the six remaining players. The final table airs on the PokerGO live stream on April 18 and plays down to the 16th champion of Season XVI.